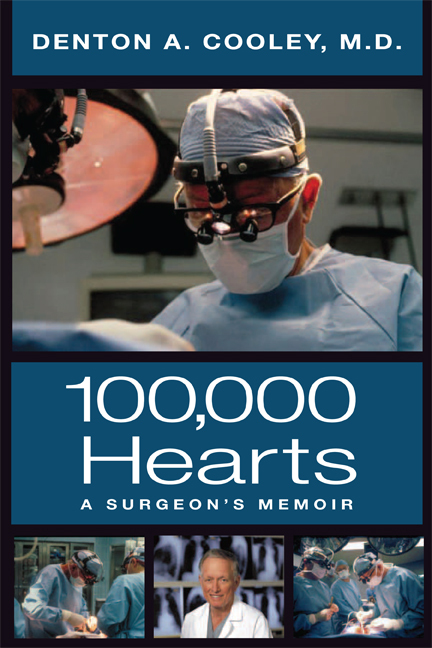 100,000 Hearts A Surgeon's Memoir By Denton A. Cooley, M.D. Pioneering surgeon Dr. Denton Cooley recalls his extraordinary career and achievements, which include performing the first successful heart transplant in the United States and the first clinical implantation of a totally artificial heart in a human being. Pioneering surgeon Dr. Denton Cooley performed his first human heart transplant in 1968 and astounded the world in 1969 when he was the first surgeon to successfully implant a totally artificial heart in a human being. Over the course of his career, Cooley and his associates have performed thousands of open heart operations and have been forerunners in implementing new surgical procedures. Of all his achievements, however, Cooley is most proud of the Texas Heart Institute, which he founded in 1962 with a mission to use education, research, and improved patient care to decrease the devastating effects of cardiovascular disease. In his new memoir, 100,000 Hearts , Cooley tells about his childhood in Houston and his experiences as a basketball scholarship recipient at the University of Texas. After medical school at the University of Texas Medical Branch in Galveston and Johns Hopkins, Cooley served in the Army Medical Corps. While at Johns Hopkins, Cooley assisted in a groundbreaking operation to correct an infant's congenital heart defect, which inspired him to specialize in heart surgery. Cooley's detailed descriptions of what it was like to be in the operating room at crucial points in medical history offer a fascinating perspective on how far medical science has progressed in just a few decades. Dr. Denton Cooley and the Texas Heart Institute are responsible for much of that progress. Denton A. Cooley, M.D., is a world-renowned surgeon and founder of the Texas Heart Institute.